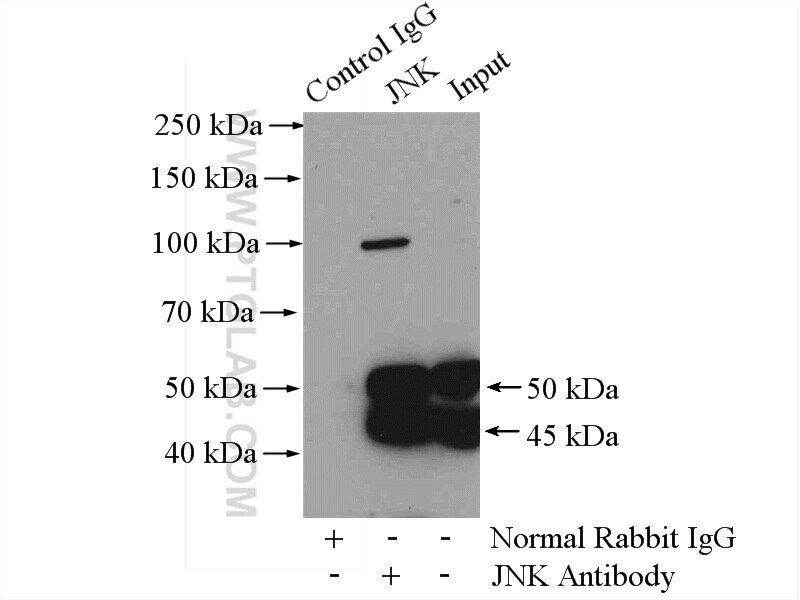 IP Result of anti-JNK (IP:51151-1-AP, 4ug; Detection:51151-1-AP 1:600) with HEK-293 cells lysate 2000ug. JNK1, also known as mitogen-activated protein kinase 8 – MAPK8, is a serine/threonine-protein kinase. It is an important player in signaling transduction pathways governing cellular response to external stimuli, including ultraviolet radiation (UV), inflammatory cytokines, and reactive oxygen species (ROS). JNK1 phosphorylates several transcription factors, such as c-Jun, Elk-1, and ATF2, affecting their transcription activity. JNK-mediated phosphorylation governs a variety of important cellular processes, and abnormalities of JNK1 activity have been implicated in obesity and cancer. There are four isoforms of JNK1 (PMID: 8654373), giving rise to 46 kDa and 55 kDa isoforms. JNK1 isoforms differ in their substrate specificity and tissue expression profiles. JNK1 is phosphorylated by MAPK kinases (MAPKK). JNK1 is present both in the nucleus and in the cytoplasm. Stress conditions and other stimuli can cause a shift in JNK1 subcellular distribution. Mlkl knockout mice demonstrate the indispensable role of Mlkl in necroptosis. Inhibition of TROY promotes OPC differentiation and increases therapeutic efficacy of OPC graft for spinal cord injury. Sialic Acid Rescues Re-purified Lipopolysaccharide-Induced Acute Renal Failure via Inhibiting TLR4/PKC/gp91-mediated Endoplasmic Reticulum Stress, Apoptosis, Autophagy, and Pyroptosis Signaling. Neohesperidin dihydrochalcone against CCl4-induced hepatic injury through different mechanisms: The implication of free radical scavenging and Nrf2 activation. Astaxanthin Pretreatment Attenuates Hepatic Ischemia Reperfusion-Induced Apoptosis and Autophagy via the ROS/MAPK Pathway in Mice.